Fifty years ago, the story spread like wildfire. There were variations, but the basic premise was this: Candy Newman, beloved daughter of Cincinnati TV personality Ruth Lyons, was dying from cancer and took one last trip with her family on a cruise ship to Europe. Late one night, in the middle of the Atlantic Ocean, Candy could not take the pain anymore and, with her last ounce of energy, pulled her weak and pain-wracked body across the lonely deck and, in the moonlight, leapt over the rail and into the dark waters below, never to be seen again. The story was repeated over and over and even today there are many who talk about that tragic night. It is, however, completely untrue and, after a half century, needs to finally be put to rest. 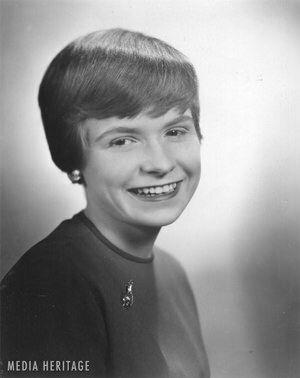 Candace Laird Newman was the center of the Herman and Ruth Lyons Newman family. Adopted shortly after her birth in August 1944, Candy Newman was the glue that kept the Newman family together. As the 1950s approached, Ruth Lyons would go on to become Cincinnati’s most popular broadcaster. Herman was a popular professor at the University of Cincinnati. As fame and attention increased, opportunities for the Newmans to go to restaurants and be seen in the community were reduced. In order to escape the limelight of local attention, Ruth, Herman and Candy cherished their opportunities to travel. And travel they did, with annual trips, usually on large cruise ships, to Hawaii, Europe, Russia and the Caribbean. Family photo albums are jammed with images of the three Newmans wearing pineapple hats, sunning next to pools and visiting castles and other ancient landmarks. It is no wonder that those vacations were an important and cherished part of the Newman family structure. In the meantime, Candy Newman grew into womanhood, shedding her Shirley Temple curls for college classes and boyfriends, such as frequent 50-50 Club guest Troy Donahue. Candy was even given a cameo “extra” role in Donahue’s 1962 film Palm Springs Weekend. But life began to unravel for the Newmans beginning in December 1964, when Ruth suffered a stroke that kept her from television for a few months. On January 11, 1965, twenty year old Candy discovered a lump on her breast. Surgery took place immediately at Holmes hospital and cobalt treatments began shortly thereafter. In the meantime, life attempted to return to normal—Candy, by now, was becoming a regular on her mom’s show and the family took a delightful cruise to England on the SS France that summer. However, by February 1966, Candy’s illness was worsening and plans were made for one last cruise. On June 3, 1966, Candy, Ruth and Herman set sail on the SS Michelangelo on a trip to Europe. By now, Candy was very ill and at least once during the voyage did the ship doctor tap her lungs to relieve the persistent coughing. By June 9th, it became clear that Candy would not be able to follow the itinerary and she was taken to a hospital in Genoa, Italy. The family rejoined the Michelangelo on June 14th for the trip home and Candy’s condition sharply deteriorated. On Father’s Day, June 19, Candy died peacefully around 10:00 in the evening, as the ship passed the Azores. The boat docked in New York on June 23rd and the next day Candy’s body was cremated at Ferncliff Cremation near Hartsdale, New York. The remains were later returned to Cincinnati and reside alongside those of Ruth and Herman in a stained glass niche at Hillside Crematorium in Clifton. The story of Candy “jumping off the boat” started to spread not long after. Perhaps it was invented because there was no public memorial or perhaps it was someone who was not a fan of Ruth Lyons. Whatever the reason, the painful story was repeated and rapidly spread and caused great suffering for Ruth and Herman, two private people who were utterly crushed with grief. Ruth retired from her show in January 1967 and both lived in seclusion until their deaths in the late 1980s. After fifty years, it’s time to put that story to bed once and for all in memory of a sweet young woman named Candy.